Maria Clementina Sobieska (Polish: Maria Klementyna Sobieska; 18 July 1702 – 18 January 1735) was a Titular Queen consort of England by marriage to James Francis Edward Stuart, a Jacobite claimant to the British throne. The granddaughter of the Polish king John III Sobieski, she was the mother of Charles Edward Stuart and of Cardinal Henry Benedict Stuart. She was born on 18 July 1702 in Oława (Ohlau), Silesia, then part of the Holy Roman Empire and now in Poland. Her parents were James Louis Sobieski (1667–1737), the eldest son of King John III, and Countess Palatine Hedwig Elisabeth of Neuburg (1673–1722). Her older sister Maria Karolina (known as Charlotte) was the Duchess of Bouillon by marriage. 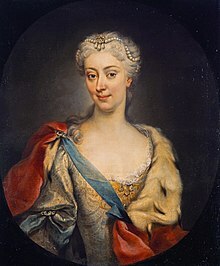 Being one of Europe's wealthiest heiresses from inheriting vast estates in Poland from her paternal grandfather, she was betrothed to James Francis Edward Stuart. King George I of Great Britain was opposed to the marriage because he feared that the union might produce heirs to James Francis Edward's claim to his thrones. To placate him, the Holy Roman Emperor Charles VI (Maria Clementina's own maternal first cousin) had her arrested while on her way to Italy to marry James Francis Edward. She was confined in Innsbruck Castle but eventually the guards were deceived and, with the help of Charles Wogan, Maria Clementina escaped to Bologna, Italy, where, for safety from further intrusions, she was married by proxy to James, who was in Spain at that time. Maria Clementina's father, James Louis Sobieski, approved her escape, declaring that, as she became engaged to James Francis Edward, she ought to "follow his fortune and his cause". Maria Clementina and James Francis Edward were formally married on 3 September 1719 in the chapel of the episcopal palace of Montefiascone, Italy, in the Cathedral of Santa Margherita. Following their marriage, James and Maria Clementina were invited to reside in Rome at the special request of Pope Clement XI, who acknowledged them as the King and Queen of England, Scotland and Ireland. The Pope provided them with a papal guard of troops and gave them the Palazzo Muti in the Piazza dei Santi Apostoli in Rome to live in, as well as a country villa at Albano. The Catholic Church also provided them with an annual allowance of 12,000 crowns out of the papal treasury. The Popes Clement XI and Innocent XIII considered James and Maria Clementina the rightful and, more importantly, Catholic King and Queen of England, Scotland and Ireland. The married life of James and Maria Clementina proved turbulent and unhappy. Reportedly, James initially had a favorable impression of her because of her beauty, while she disliked him because of his lack of it, as well as his passive nature. She befriended the governess of her son, a Mrs Sheldon, who became her confidant and favourite. On the other hand, she disliked the influence of James' favourite John Hay of Cromlix and his wife Marjorie, and reportedly, she suspected James of having an affair with Marjorie Hay. In 1725, soon after their second child's birth, James fired Sheldon and appointed James Murray as the guardian of their sons against the wishes of Maria Clementina. She left him and went to live in convent of St. Cecilia in Rome with her favorite Sheldon and the rest of her personal retinue. She accused her husband of adultery, while he said it was sinful to leave him and her children. Upon the advice of Cardinal Alberoni, who claimed it was her only chance to gain support against her husband, Maria Clementina claimed that James wished to give his son a Protestant education. This claim secured her the support of the Pope as well as the Kingdom of Spain against James and the sympathy of the public when she demanded that James remove the Duke of Dunbar and the Hays from his court and reinstate Sheldon in her position. In April 1726, James granted her sons permission to visit her. The whole affair was seen as a scandal in Europe and reported about by anti-Jacobite agents in Rome. In May 1727, through the mediation of the duke of Liria, James removed the Hay couple from his court, and in January 1728, Maria Clementina and James reconciled in Bologna. In practice, however, Maria Clementina and James lived the rest of their marriage separated: James preferred to reside in Albano, while Maria Clementina lived in the Palazzo Muti in Rome. She was prone to depression, spending much of her time praying and submitting to religious fasting and other Catholic ascetic rituals, which is thought to have played a role in the fact that she never conceived again. Her sexual relations with James soon discontinued; they seldom dined together, and though they were officially reconciled, she preferred to avoid him outside formal occasions. Maria Clementina did perform the ceremonial functions she had as Jacobite queen: in June 1729, for example, she gave an audience for Montesquieu. Her favourite Mrs Sheldon did not officially reside at the Jacobite court, but she provided her with a residence close to it, and kept her as a confidante. Her relation to her younger son was not close, as he was his father's favourite, but she was close to their elder son Charles, who was his mother's favourite: during an illness of Charles in 1732, for example, Maria Clementina tended to him despite the fact that he fell ill in Albano and she was thus forced to meet James. Her health was weakened by her ascetic life style and deteriorated as the years went by. Maria Clementina died at the early age of 32 on 18 January 1735. She was interred with full royal honors in St. Peter's Basilica in Rome. Pope Clement XII ordered that she have a state burial. Pope Benedict XIV commissioned Pietro Bracci (1700–1773) to sculpt a monument to her memory, which was erected in the Basilica. Henry Benedict Maria Clement Thomas Francis Xavier Stuart (11 March 1725 – 13 July 1807), later known as the Cardinal Duke of York, never married. Maria Clementina by Pierre Imbert Drevet. "Pompe funebre" for Maria Clementina at Rome. Maria Clementina's Tomb by Bracchi in St Peter's Basilica, Rome. Wikimedia Commons has media related to Maria Clementina Sobieska. ^ Sobieska is the proper spelling of her last name, for she was female. However, English language literature commonly uses the spelling Sobieski, which is appropriate for a male member of the family. Gaetano Platania, Angielskie małżeństwo ;arii Klementyny Sobieskiej, in "Sobótka", 2, 1980, pp. 401–410. Gaetano Platania, Morte di Maria Clementina Sobieska Stuart: il caso di Michele Marieschi progettista di apparati funebri, in ARTE/Documento. Rivista di Storia e tutela dei Beni Culturali, 4, 1990, pp. 164–173. Gaetano Platania, La politica europea e il matrimonio inglese di una principessa polacca: Maria Clementina Sobieska, Accademia Polacca delle Scienze-Biblioteca e Centro Studi a Roma, Manziana (Roma), Vecchiarelli editore, 1993. Gaetano Platania, Viaggio a Roma sede d'esilio. Sovrane alla conquista di Roma: secoli XVII-XVIII, Istituto Nazionale di Studi Romani, Roma 2002, pp. 99–118. This page was last edited on 22 October 2018, at 08:57 (UTC).